Ah, bound buttonholes. Aren't they such a lovely detail? This is my absolute favorite method of making bound buttonholes. The first part is called the "windowpane method" because you make a little window in your fabric using a silk organza facing. "Lips" are formed with two squares of fabric behind the window. Always make a test buttonhole in your actual fabric! 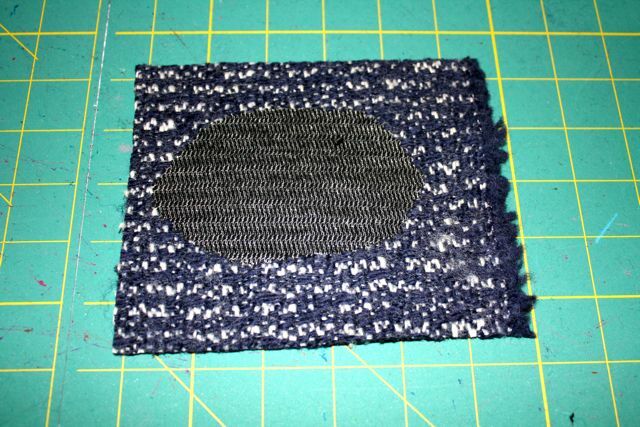 Here I'm using some scraps in different colors so you can see it well. 1. 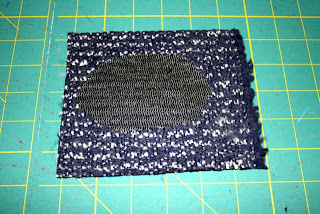 The first thing to do stabilize the area with a fusible interfacing. 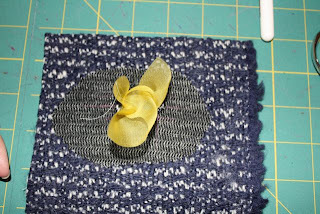 Cut out a small circle of fusible (I like Weft interfacing for this purpose) with pinking shears. 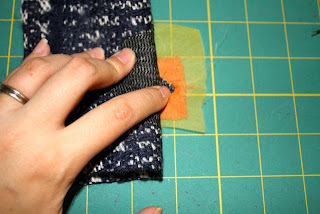 Fuse it to the wrong side of your fabric where the buttonhole will be positioned. 2. Next, mark the placement of your buttonhole. I like a chalk pen in a bright color for this purpose. 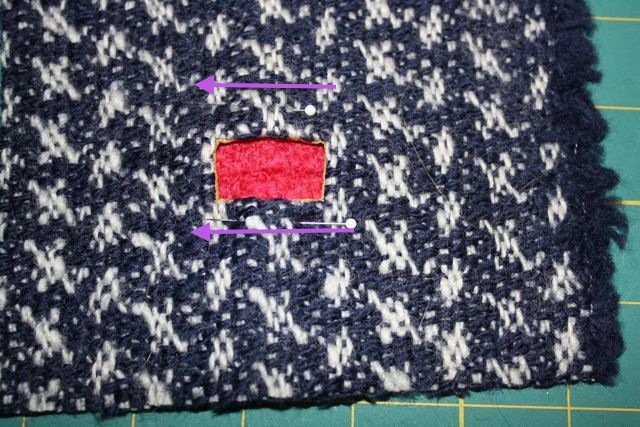 Here is the buttonhole line and ends marked. 3. Now, draw two more lines: each 1/4" on either side of the horizontal buttonhole line—one line above it and one line below it. This outer rectangle will form the "window". Here it is marked in red. 4. 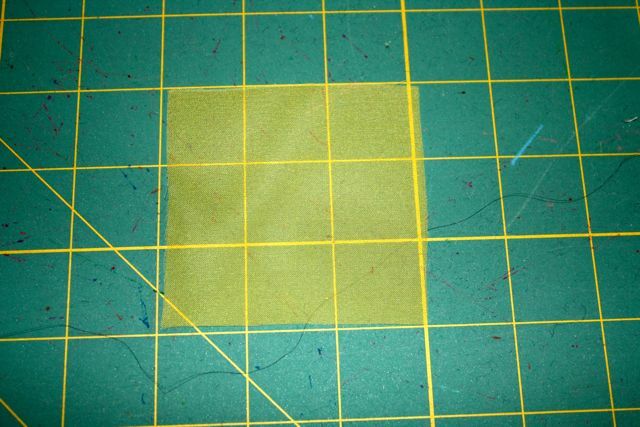 Now cut out a square of silk organza that matches your fabric closely. (I'm using a contrasting color here so you can see it). I made my square 3". 5. Now, center this square over your buttonhole marking, on the right side of the fabric. Pin it in place on each side of the square. 6. 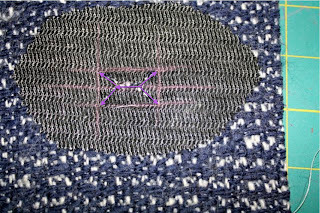 Now take this to your machine and machine stitch around the rectangle for the window. (Marked in yellow here.) 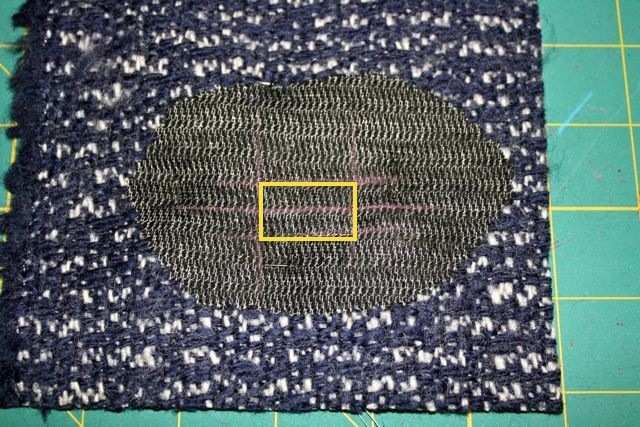 Use a very short stitch length and follow your markings very carefully. Pivot at each corner. It helps to start along in the middle of a long side. 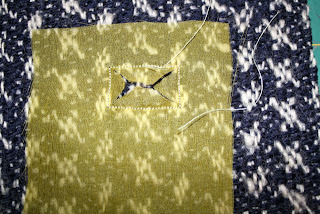 If you want to be really precise, you can count your stitches per side to make sure it's even. 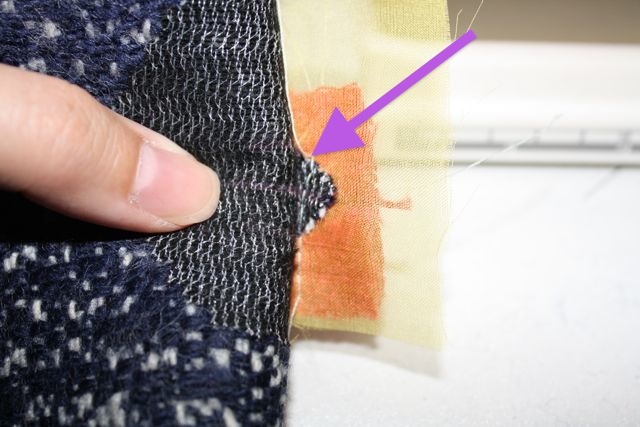 Another handy tip is to use a clear foot so you can see where you're stitching. 8. Now you want to push the organza through to the wrong side. 9. Use your iron to press the organza flat, pulling it through as much as possible so the organza is almost undetectable on the right side. On the right side it forms the "windowpane." 10. Now it's time to form the lips of the buttonhole. (Note that I'm using a contrasting color of fabric here so you can see it.) 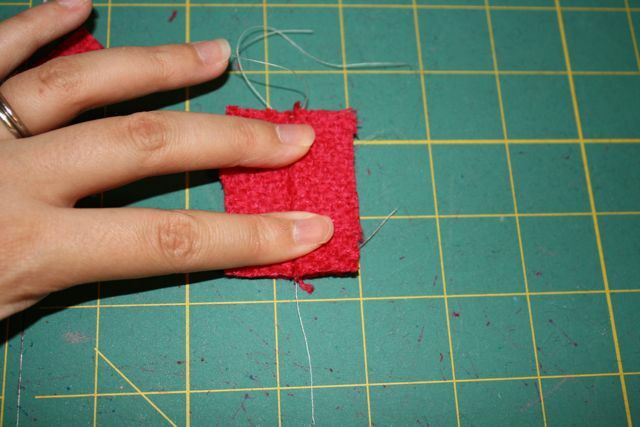 You need to cut out two pieces of fabric that are 1-1/2" high and one inch longer than the width of your buttonhole. 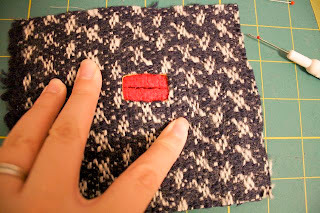 In this case, our buttons are 1", so your fabric pieces will be 1-1/2" tall by 2" wide. Cut two of these pieces. 11. 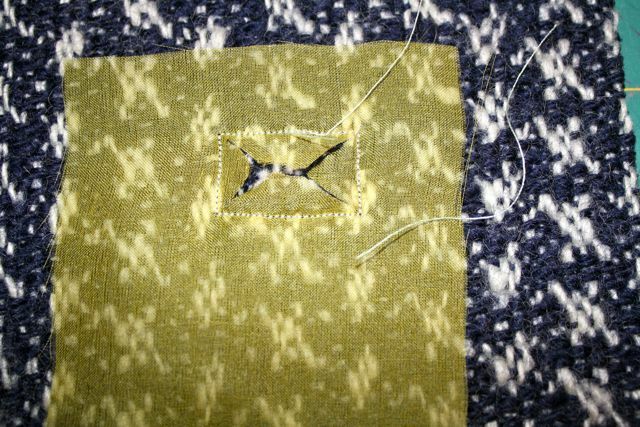 Now pin the pieces together, right sides together and mark a stitching line down the middle (vertically) of the two pieces. 12. 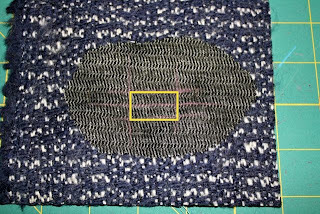 Stitch down this line with a long basting stitch. 13. Now you want to "butterfly" the pieces open so the right sides are out and each piece is folded over itself, with the basting stitch holding the pieces together down the middle. Press the piece so it retains this shape. These are your upper and lower lips of your buttonhole. 14. Place the lips behind your window and pin on the top and bottom (where the arrows are). **Note: at this point, you may want to slip stitch the lips in place around the edge of the window. This will ensure that they won't move at all during the next steps. 15. 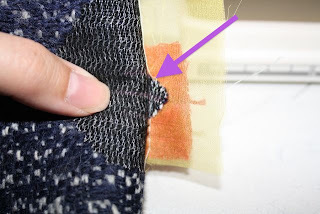 The goal of the next steps is to secure the lips in place by machine stitching the lips to the "triangles" formed when you ironed the organza in step 9. Remember the little triangles on the back? Fold one side over itself so you can see the triangle on top of the lips. 16. 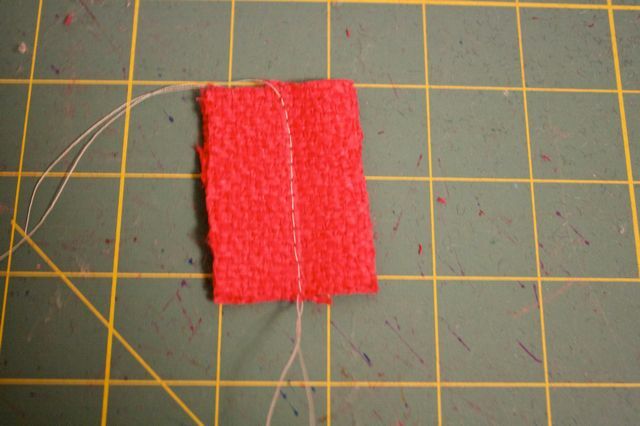 Take it to your machine and stitch the triangle to the lips. I like to use a zipper foot so you can get really close to the fold of the outer fabric. Here you can see the stitching line. 17. Repeat this step on the triangle on the opposite side. Now, repeat it on each of the triangles on the long edges. All four triangles are stitched down now. And your buttonhole is finished! 18. 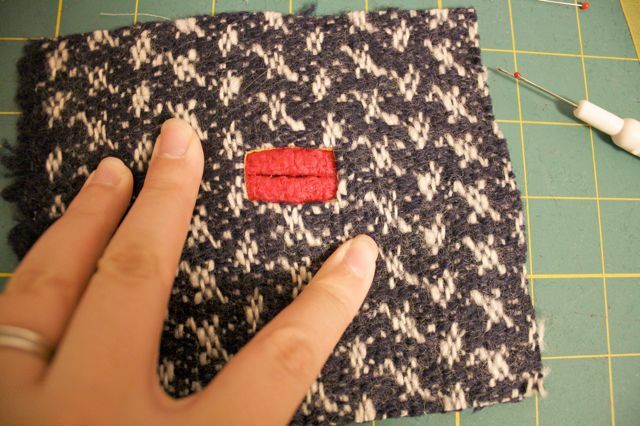 When your coat is finished, you'll remove the basting between the lips. 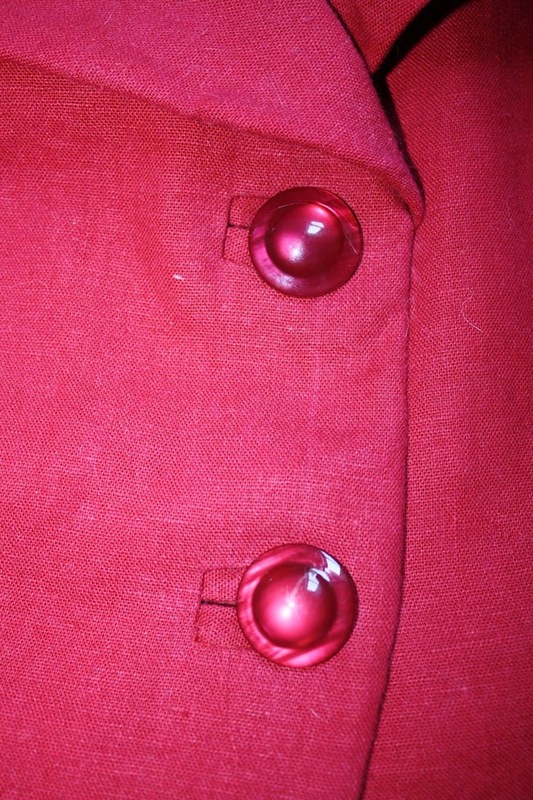 It's a good idea to test your practice buttonhole with your actual coat buttons. Make sure it passes through the buttonhole easily. That's it for now! 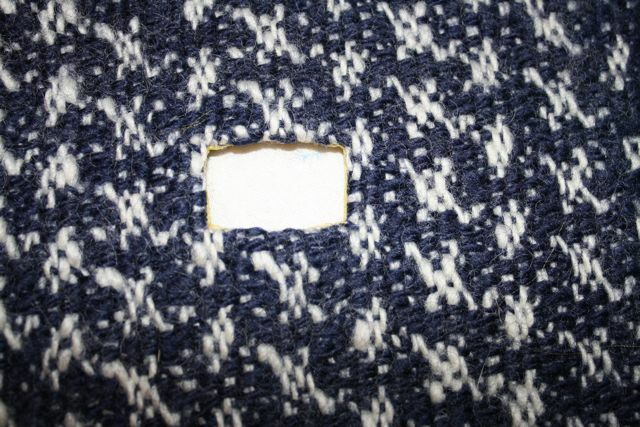 After we stitch the lining and front facing onto the coat body, there will be another step where we'll make little openings in the facing for the button to pass through, on the backside of the buttonhole. Basically, it involves cutting open a window on the facing and slipstitching it around the back of the buttonhole. This is a great tutorial. I remember when you first did bound buttonholes - wow! You've refined your technique. I've never even considered doing them because of the complexity - now you've made it easy, I dare say! Thanks a lot! Now, I can't wait to make them! Thanks, Pammie! I do hope you'll give them a try. For best results, thread trace the lines. 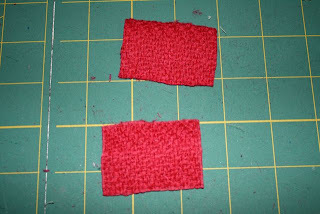 Sew the two sets of parallels in different colors so you can see the intersection. 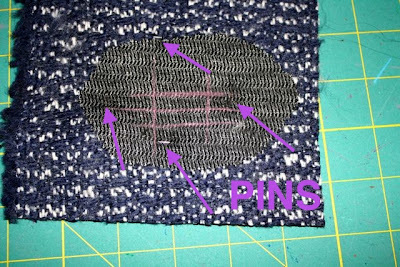 Considering that a screw-up will ruin the jacket, I would do everything to maximize control, including pinning and then basting. You MUST check that the lines of the box are perfectly parallel; otherwise the structure of the box will be off. I realize you're doing a sample, and it may be the photo, but your box looks slightly bowed. When you sew, leave long machine threads. 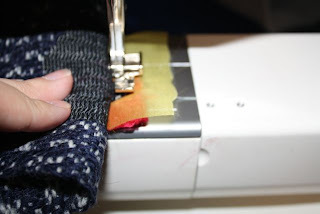 If one line is too long by a stitch or two, pull out the stitches to make the two parallel lines even. 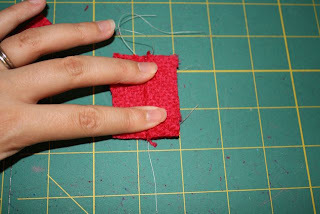 If it's too short by a stitch or two, you can try threading the ends into a needle and adding the stitch. If it's more than a few stitches, you may have to remove the entire line of stitches. Sewing a perfect box consistently can be difficult. 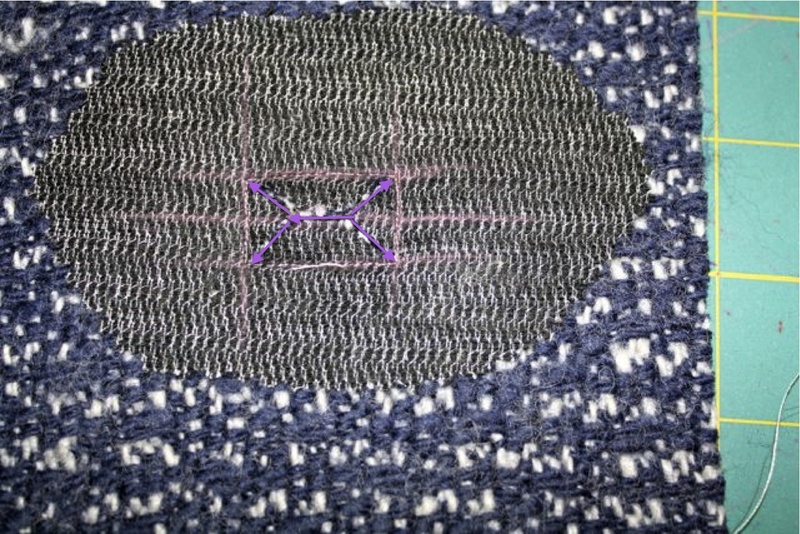 I prefer the method in which one machine stitches only the two parallel upper and lower lines. The triangles are cut, pulled back and sewed three times for reinforcement. 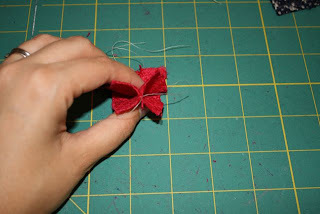 To start the opening, I would use a an Exacto or buttonhole knife or a very sharp pair of scissors. The ordinary seam ripper might cause major problems. I would make several samples before doing this on my jacket. G: This timing is PERFECT! I have stay stitched everything and was looking for the next thing to do. I know it's the buttonhole but, in truth, I'm totally freaked. The tailoring book you recommended also has an excellent tutorial, but this seems more user friendly! 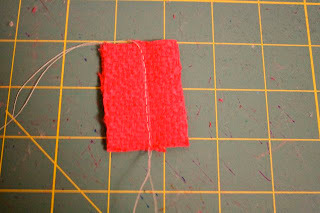 Use silk thread for the thread tracing. Easier to pull out and usually it does not leave an impression, even when pressed. Walk the machine if necessary. Or pause and walk it as you approach the intersections or the end of the sewing lines. What a great tutorial (as always)! Your instructions are very clear and easy to follow. No need to fear the bound buttonhole now! Thanks, Gertie! I think this method has a better likelihood of perfect results the first time. 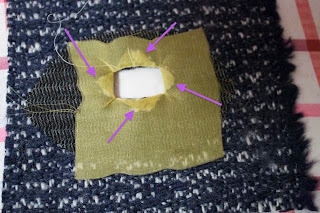 How do the buttonholes work with the lining? I mean, if you do them before lining the coat, how to you fix the lining around it? Excellent tutorial! 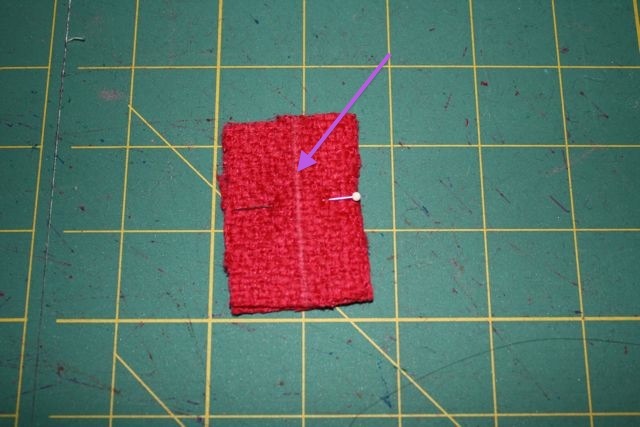 Every time I've looked at a bound buttonhole tutorial I've been very confused (although someone else recently posted another good one - can't remember offhand who it was!) I'm absolutely scared of bound buttonholes and welt pockets! I'll be steeling myself up to try it out! 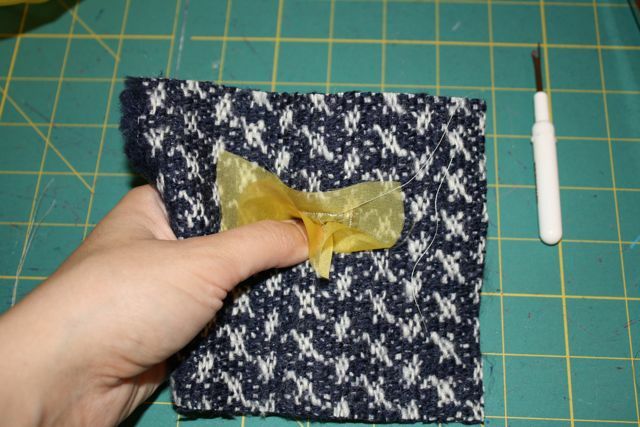 A bound buttonhole tutorial I could read without my eyes crossing and my mind wandering. Thanks Gertie. I'll be using this in the future. This is a great tutorial. I have some wool I was planning to make a coat out of. I think I will try this technique out. Bound buttonholes make a jacket look really nice and professional. Sewer: thanks for the great tips! K. Line: I'm not sure if it would work with other fabrics. No harm in giving it a try on some scrap fabric though! As for the lining back pleat, it should invert on the right side. The illustration on pg 12 is showing the wrong side of the fabric. Hope that helps. Thanks for the nice comments, all! Nifty, thank you! I don't have any silk organza either, but I shall try and track some down. I'd like to echo what other posters have said - this tutorial really de-mystifies bound buttonholes!! I've always thought they were impossibly advanced for me, but now I'm inspired to try them. Thanks! HOLY COW!! You make it looks so simple! I cannot WAIT to use this technique. WONDERFUL!! This is SO crystal clear! I have tried to do welt pockets and it was quite annoying! It looks so much neater with the patch. Oh, Bratling: as to your question about the lining. It's actually just the front facing that will be behind the buttonhole. I will show you how to make a little window and finish the back of the buttonhole when we get to that step. 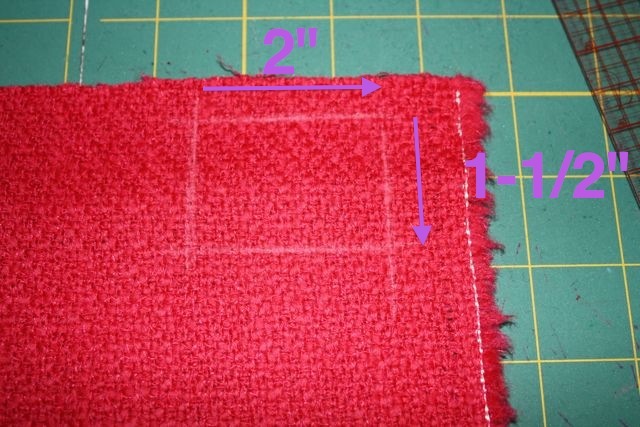 Is it possible to add the bound buttonholes later in the process, or do they have to be done before assembly for some reason? Why I ask: I did an alteration to my front, and it kind of looks like the button and buttonhole placement is off now, so I wanted to wait until I could try it on and make sure I like where the buttonholes are. Also, would there be only 1 bound buttonhole, or 2? Since the 2nd buttonhole is hidden by the wrap front, I suppose it would either be OK as a plain buttonhole, right? Thanks Gertie. Great tutorial :) I'm not doing the Lady Grey sewalong. Not enough time and I've been distracted by lingerie sewing :) I've bookmarked your blog post for later because I love the Lady Grey pattern. Thanks for sharing your knowledge with us. That was possibly the easiest to understand sewing tutorial I have ever read. Thanks Gertie! 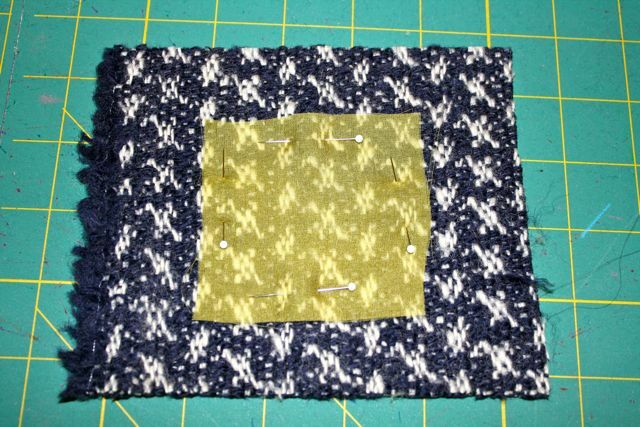 I'm really excited to do my first bound buttonhole. What a neat way to do this! Thanks for an extremely well-done tutorial. I wasn't going to do bound buttonholes previously but now I think I will. Button holes always freak me out!!! 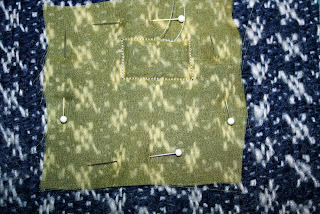 I reduce buttonholes as much as possible. I shall give this a try to see how it comes out. Of course first on a test piece!!! : )You make it sound not very difficult !! Thanks!!! Oh this is seems so much easier than the eay I did them last time! Thank you! that's lovely, one thing I dont think i"ve ever done, and yes after seeing your tutorial I feel I might dare! 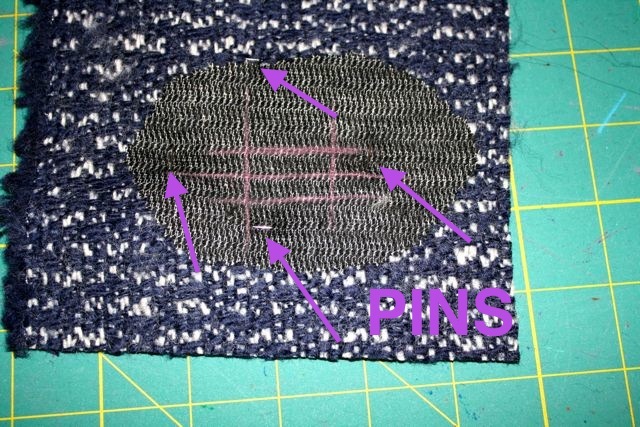 your posts and the comments of all wonderful followers make a bunch of great ideas and guidelines for anyone interested in perfecting their sewing skills! thanks, have a lovely week! Awesome! All I can say is I would buy a book of your tutorials. Let me know when it is available!!! 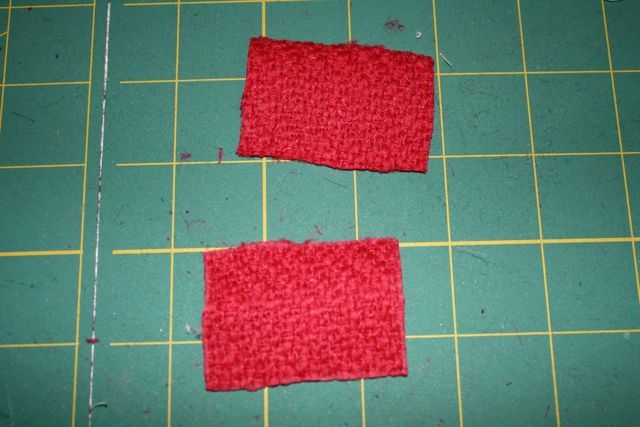 Thank you Gertie, I really like this way of making bound buttonholes! Wow, you make it so fantastically clear that it completely demystifies bound buttonholes and takes all the fear out of the process. I'm sure there's still plenty of skill I need to acquire, but having grasped the principle behind them is a wonderful head start. Invaluable, thank you! Best bound-buttonhole tutorial I've seen yet. Not kidding. I now think I could actually do this without wanting to stab somebody to death with a seam ripper. That's a great tutorial! Way easier and cleaner than the way I usually do them. I'm so going to use this method for my next bound buttonhole! Thanks for posting this tutorial, Gertie. As well as all the others. 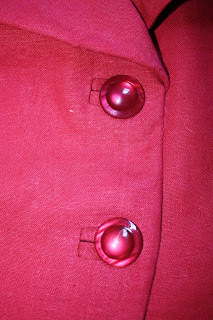 The princess seam guide was a lifesaver (coatsaver). They've been helping immensely with my coat. Gertie: I'm not sure if you've already answered this elsewhere (if so, pls. just tell me where), but I'm confused about the positioning of the buttonhole on the actual fabric (and by corollary, the position of the button). I'm using 1/2 inch seam allowances. 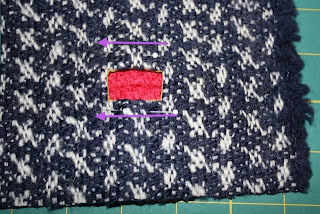 I've moved my buttonhole in on the pattern such that it begins 1/2 inch in (to honour the SA) PLUS the distance that the original button outer vertical marking line was marked from the pattern edge I cut for the 8. That amount is an additional 2/3 inch. 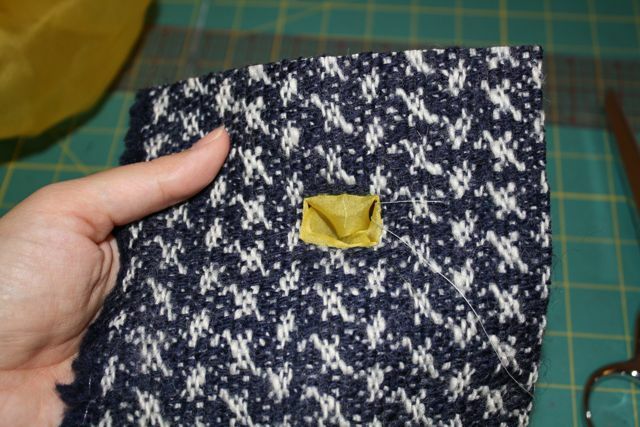 This means my button hole is going to be 1 1/8 inches away from the outer edge of the pattern i.e. outer edge of the SA. Is this the right way to measure? I just don't want to cut the button hole in the wrong spot. Additionally, I'm wondering (though I know this isn't crucial for right now) where the buttons will land. I've moved them in by 1 1/8 inch from the SA also (so that they align with my newly placed button holes, but again, I'm kind of guessing on this. One more question, while I'm leaving the longest comment ever, I shortened the waist by an inch. I'm leaving the line where it was i.e. neither raising nor lowering that buttonhole. I figure, where it lands now is my actual waist and where it should fall. Hey all! Sorry I'm behind on answering questions. 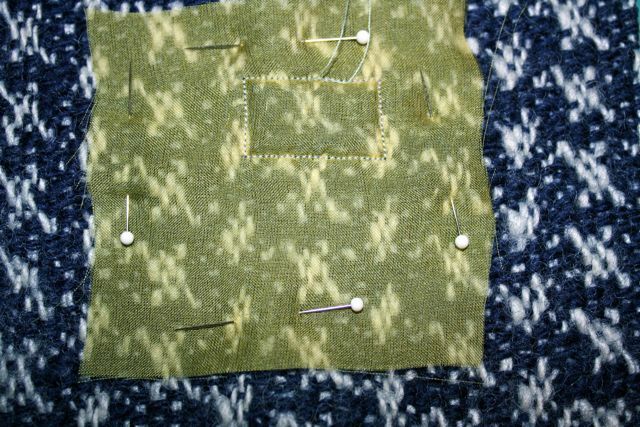 ChissyJ, the best reason for doing the buttonholes now is that in the next step, your coat front is going to be covered in hair canvas and you won't be able to make the buttonhole. 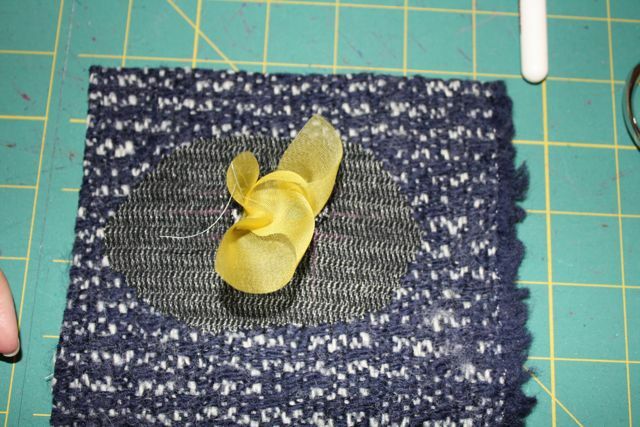 But if you're using a fusible rather than sew-in interfacing, you could wait until the body of the coat is assembled. I did bound buttonholes on both sides, but you certainly don't have to. Since the inner button is hidden, you can do whatever you want. I did a bound buttonhole, but I'm going to use one of those clear flat buttons that go inside coats. K. Line, that sounds kinda far away from the front edge of the coat. I just measured my buttonholes and they start 1/4" in from the seam allowance. I looked back at the pattern, and it seems odd to me that the buttonhole placement is the same for all the sizes. Am I missing something? Anyway, you don't want your buttonhole in too far from the edge . . . maybe try 1/2 in? Did you mark your buttonholes in the muslin stage? If not, just something to remember for next time. Also, K. Line, it sounds like your buttons are in the right place on your waistline! Bookmarking this.... for welt pockets!! I hope this will be in your new book. :) Thanks Gertie. I love the silk organza idea. You make bound buttonholes the way I learned oh so very long ago, but using a piece of the garment fabric instead of organza. And, you were to cut the facing fabric on the bias so it was easier to turn to the inside. I've tried straight grain and bias, and bias really does work better. Bound buttonholes are the one reason I buy enough fabric to redo the front just in case. You can always make a hat or handbag with the extra if you don't mess up. I agree with what Sewer said, and would add: leave the marking for a day to look at them with fresh eyes before you cut the openings. This is a great tutorial! Thank you. This method is very different from the ones I've tried so far. I'll have to give this a go. Finally tried my first bound buttonhole, thank you for an excellent tutorial Gertie! I agree that the silk organza is probably necessary. I used my poly lining, and it just won't completely fold under, bits of it are peaking out. Off to find some silk organza and silk thread!! I wanted to add, per Mac Berg of Vogue Fabrics, that you also want to interface the sleeves exactly the same way as the bag. 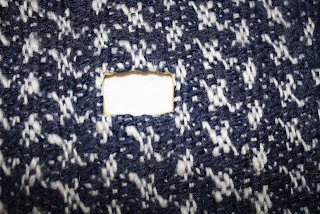 Think of the interfacing piece as an upside-down U. The U is the hair canvas. You 'fill in' with the muslin, which will give you wearing ease. You also do the upside-down U on the back...it's just considerably wider. 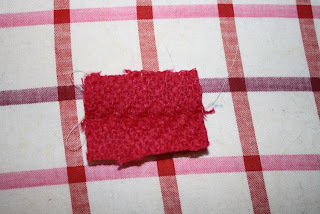 Of course, pinking shears, pinking shears so edges 'blend' in with the fashion fabric. This tutorial is brilliant. 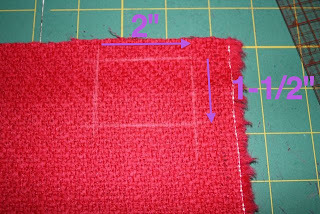 I have combed the internet for a bound buttonhole tutorial for my red wool cape and after trying yours, it is the only way for me. Thank you for sharing your genius. HELP! I don't understand that 'butterfly' step. Just realized I forgot to do the bound buttonhole before I basted in my hair canvas. Doh! Fortunately, I've only done the left side, which will be hidden when the coat is buttoned, so I think I can get away with a plain buttonhole there, and do a bound one on the right/outside side. 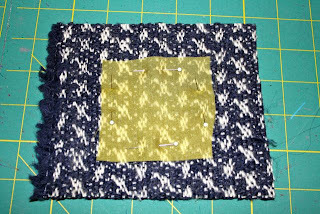 Thanks for the tutorial--I've never done bound buttonholes before, and I see lots of practice buttonholes in my future! OH What a fantastic method! So much easier & tidier than making bound buttonholes like a tiny welted pocket. While I can get a pocket to look nice, buttonholes always make me want to scream (ok I sometimes actually do scream). Now I'm re-inspired to try again! Thank you! a question:why u use silk organza flat?! 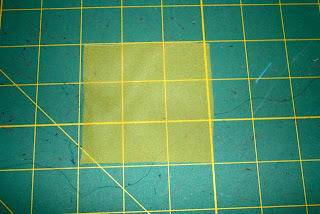 first u stabilize the area with a fusible,that`s nOt enough?? Ok..these instructions look fabulous and VERY easy to read and follow. I am going to adjust them to make hand openings in a long velveteen cape. There are none on the pattern. The openings are 8 1/2 inches and on a bit of an angle. I will have to play around a bit with fabrics for the lips, but I will let you know how they turn out! First time I have been to your site, and I really enjoyed it. My Mom Majored in Home Economics in college in the late 40's (I wonder if such a thing is even offered anymore) and I have all of her text books. The detail and embellishments are incredible. Also have many of her patterns from the 40's through the 60's, and I treasure them. Well...the bound buttonholes are absolutely perfect!! Instead of the organza, I used a high thread count cotton (actually a quilting batik) and it worked very well. Thanks again...your instructions were great.